Thanks to NASA's Solar Dynamics Observatory, we can now see incredibly detailed views of the suns surface. We are able to witness solar flares, CMEs, coronal rain like never before. 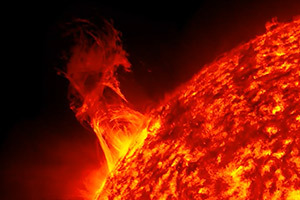 This is a series of videos - timelapses created from thousands of images taken by SDO and compiled into stunning video. The SDO captures an image of the sun every 12 seconds in various wavelengths. These video are created from thousands of those images.